Conduct a flight from Santa Maria Airport (KSMX) to Bakersfield Meadows Field (KBFL) and obtain VFR Traffic Advisories en-route. Learn how to obtain VFR Traffic Advisory Services while airborne. Fly from KSMX to KBFL. While airborne pick up traffic advisories to KBFL. Inform ATC on initial contact at KSMX that you are performing the CAT-5 Rating. Both KSMX and KBFL are located in Class D airspace. In order to operate in Class D airspace you must obtain two way radio communications with ATC by calling them and having them reply with your callsign. VFR Traffic Advisories (commonly known as flight following) is a radar service that is provided by Air Traffic Control facilities for VFR aircraft. It provides VFR aircraft with traffic information. Flight Following is provided by radar equipped Air Traffic Control Facilities. Generally these types of facilities can be classified as 1 of 2 types. The first is an Air Route Traffic Control Center (ARTCC), commonly referred to as a Center. There are 22 ARTCCs which cover the entire United States. The second type of radar equipped ATC facility is the Terminal Radar Approach Control Facility (TRACON) commonly referred to as an Approach. TRACONs exist around larger airports and can cover smaller airports near larger airports. Both ARTCCs and TRACONs can provide flight following services. TRACONs can also provided several other types of radar services to VFR aircraft which will be covered in this flight and in later flights. Flight following can be requested on the ground at a towered airport prior to departure or after takeoff. For this flight we will pick up flight following after departure. In order to pick up flight following you need to know the local frequency for the TRACON or ARTCC facility covering your departure airport. The airport information page for SMX on Skyvector has this information in the Communications section. Otherwise, an official reference would be the Chart Supplement for SMX (also available on the same Skyvector page, although it is still called the Airport Facility Directory on that site for now). 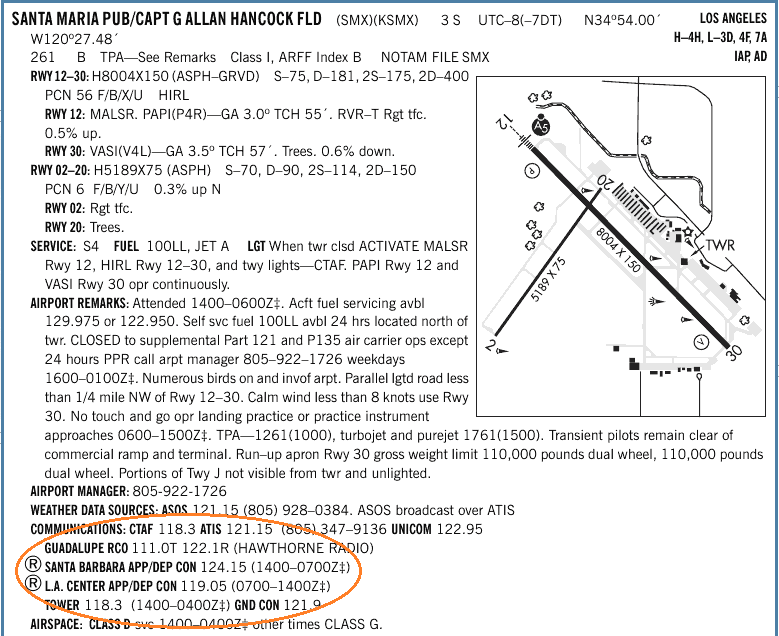 Looking at either of these references, we see that the local radar controller frequency is 124.15 with Santa Barbara Approach. Air Traffic Control will assign us a squawk code to put in our transponder and shortly there after identify us on radar. Once we have been radar identified there is nothing for us to do except listen for Air Traffic Control’s transmissions to us regarding traffic or passing us on to another controller. When you no longer desire flight following simply let ATC know and they will tell you to squawk VFR and send you on your way. Note that flight following is a workload permitting service. This means that ATC can deny flight following requests or terminate flight following at any time. If this happens you can simply fly the flight without radar services (as we did in the last flight). Finally, the fact that ATC is providing traffic information does not relieve you of your responsibility to see and avoid other aircraft. Aircraft arriving into larger airports served by a TRACON have the opportunity to obtain basic radar services. Basic radar services are provided by all TRACON facilities and consists of traffic advisories, limited radar vectoring, and sequencing into the airport. Basic radar services can be requested in the same way as traffic advisories and are automatically provided to aircraft getting flight following into airports where this service is available. 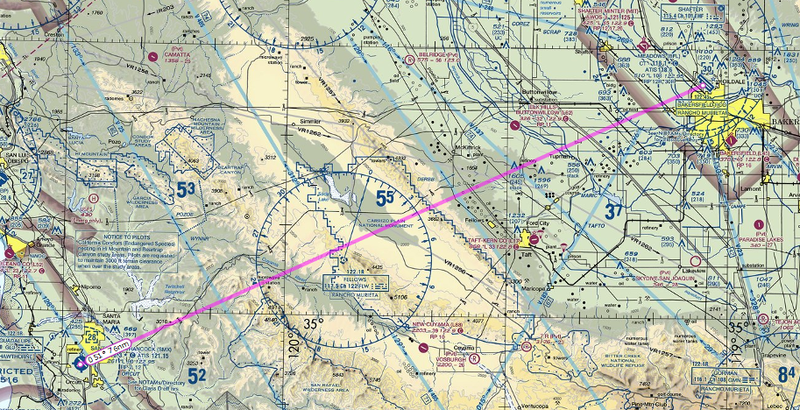 In our case KBFL offers basic radar services (provided by Bakersfield TRACON). The Chart Supplement provides information on this (look for an R in a circle next to the facility name in the communication section). When switching to the TRACON that covers your landing airport you should advise them of your intentions at the airport, and that you have the proper ATIS code. When clear of the KSMX Class D airspace you can switch off of tower frequency. Switch to 124.15 to obtain flight following. Switch to Bakersfield Approach on 118.80. By this time you should have the ATIS for Bakersfield airport. When 10NM From KBFL expect approach to hand you off to tower.